Recognize me? I’m Petey the Puck! The 2013-14 NHL season is over. Congratulations to the LA Kings (you rat bastards)! More importantly, last year was the 60th season of Hockey Night in Canada. Not that it will end anytime soon, but will CBC no longer own the exclusive rights to NHL broadcasts in Canada. 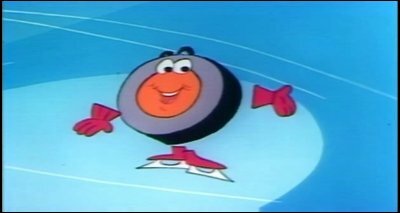 In remembrance, here is the classic videos of Petey the Puck from the 1970s. I watched him growing up and even then thought he was a bit dorky. But, that’s nostalgia for you. Regardless, here’s looking forward to Sep and Oct!